Wear a birthstone bracelet that’s Made in the USA by two renowned sculptors who happen to share the same birthday. Boston-based twins, David and Mark Stepper, started handcrafting bangles after many requests from fans of their sculptures. Each bracelet is made from recycled brass, then dipped in genuine silver for a timeless finish. The charms are made from Swarovski birthstone crystals. David and Mark created an adjustable three-circle clasp so the bracelets fit perfectly on different-sized wrists. 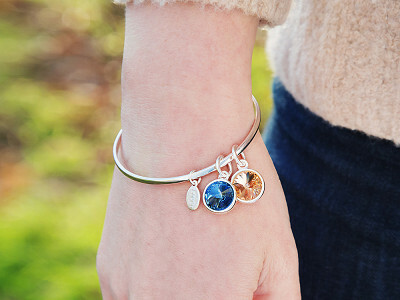 Wear a single charm to match your birthday month, or or pay tribute to loved ones with multiple crystals on one bangle. We’re glad these local sculptors branched out, because their latest endeavor is beautiful. Hello everyone! I'm proud to introduce Float Jewelry to The Grommet. We'd be happy to answer any questions you have! What is the circumferance of the bracelet? @JUDITH Hi Judith, thank you for your question. Our bracelets are hand-formed so the circumference will vary slightly with each bracelet. Using the adjustable clasp, the circumference can range from slightly under 7" to the largest size of 7 3/4"
To further clarify. When the hook is engaged with the first opening (largest size) the inner circumference measures approx 7 3/4". When the hook is engaged with the middle opening, the inner circumference measures approx. 7 1/2". When engaged with the third opening (smallest size), the inner circumference measures just under 7". Our bracelet fits most women, including women with hard to fit small wrists. 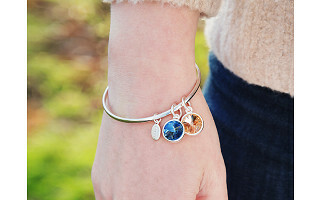 Is one able to add other charms to your bracelet? @Alicia Great question Alicia! Through The Grommet, you have the option to add additional Float crystal charms. Your bracelet will be custom assembled in our studio. If you were considering adding some of your own charms that would be best handled by a jeweler. 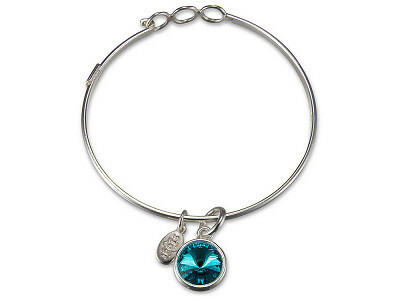 We have a rectangular "stopper" on our bangle that prevents our charms from falling off. This stopper would also prevent you from threading your own charms onto the bracelet. A jeweler will be able to place your other charms onto the bracelet with a durable jump ring. I have 10 grandchildren (so far). Can I order/fit 10 charms to a single bracelet? @Ronnie Hi Ronnie, thank you for your question! Yes, this is something that I think The Grommet Team would be able to accommodate for you. Another option would be to order two bracelets, each with five birthstone charms, and then wear the two bracelets "stacked" together. This would be a very pretty look and it would distribute the charms nicely! 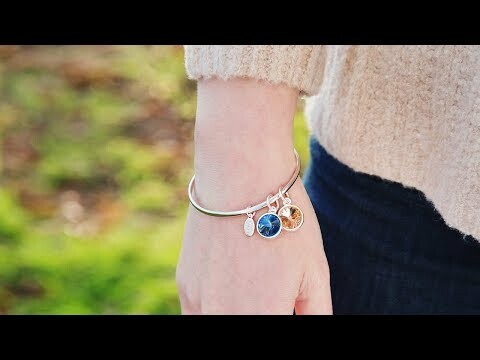 Wear a birthstone bracelet that’s Made in the USA by two renowned sculptors who happen to share the same birthday. Boston-based twins, David and Mark Stepper, started handcrafting bangles after many requests from fans of their sculptures. Each bracelet is made from recycled brass, then dipped in genuine silver for a timeless finish. The charms are made from Swarovski birthstone crystals. David and Mark created an adjustable three-circle clasp so the bracelets fit perfectly on different-sized wrists. 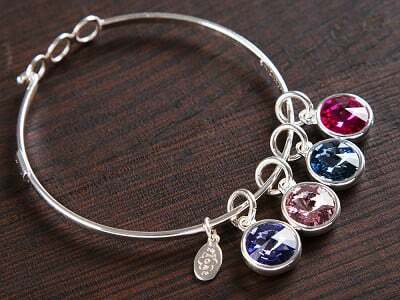 Wear a single charm to match your birthday month, or or pay tribute to loved ones with multiple crystals on one bangle.